Today’s Singaporean professionals are tech-savvy, visionary, and hard-working. They’re also hungry— for more than just success. That’s why a few Singapore caterers are expanding their catering options to include nutritious lunch options for employees and their bosses. 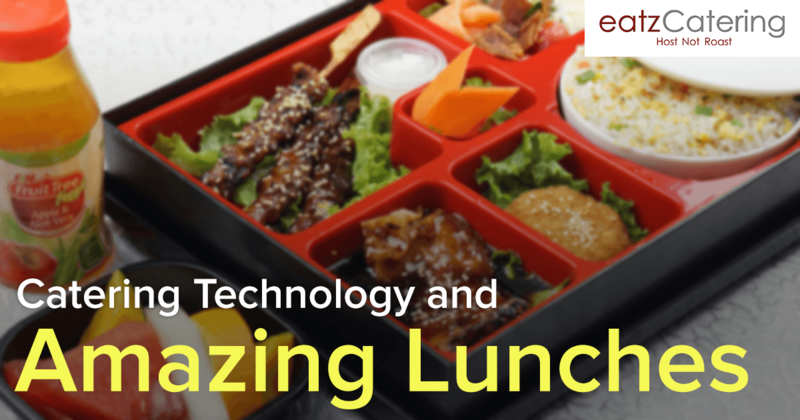 Discover how Eatz Catering combines technology and delicious boxed lunches for Singapore’s professionals. In the course of a busy workday, there’s little time to accomplish personal tasks, like planning for lunch. Eatz Catering makes it quick and easy to order boxed lunches online. The simple, straightforward ordering system lets clients put in their lunch requests, along with the date and time they would like the food delivered. While Eatz Catering can sometimes do quick turn-around orders, it’s best to order the food a day or two in advance. If you have a special request for timing or menu options, call us and we’ll let you know if we can make it happen. An active Facebook page is a must-have for a professional Singapore catering company looking to tap into the young professional market. Eatz Catering keeps its Facebook page fresh with gorgeous photos of recent events, interesting blog posts, and information about sales or special deals. Visitors to the Facebook page can glean helpful tips about catering and event hosting. Fresh content is key to keeping Eatz Catering in the Facebook newsfeed of its millennial clients. Eatz Catering offers an ample array of options for hungry professionals. If you’re gathering with a group of 9 other colleagues for an indulgent lunch, the lacquer boxed lunches are the perfect choice. These lunches come in sets of 10, and they are priced at $25 each, or $26.75 with GST. Choose the Japanese, Western, Italian, or Cantonese menu and enjoy a delicious selection of seafood, poultry, rice or pasta dishes, vegetables, dessert, and a drink. If your budget per lunch is lower, try the Deluxe Bento sets, priced at $10 each for a minimum of 20 guests. The Deluxe Bento Set A inludes sweet-sour chicken with Trio Capsicum, golden prawns with salted egg yolk, Sotong Yu Tiow, French beans with mushrooms, garlic fried rice, and sweet longan with grass jelly. You may not have 20 people to go in with you on the order, in which case you could select the Premium Bentos, available for groups of 10 people at $13.80 apiece. Premium Bento boxed lunches have special daily menus. For example, Monday Set A features hickory smoked chicken, fish fillet with tartar sauce, halal grilled cheese sausage, buttered vegetables, fried rice with chicken ham, a brownie, and juice. Tuesday Set A celebrates Asian flavours, with grilled scallops in Teriyaki sauce, garlic fried rice with seaweed, chicken Katsu on lettuce, seafood Gyoza, Caesar salad, chocolate fudge cake, and juice. If you’re feeding a crowd at your workplace, you’ll want to explore the Packet Meal options. These lunches serves groups of 20-50, at prices ranging from $3.50 each to $8.00 each. The meals include steamed rice, one or two meats, one or two vegetables, and a side or two. You can also add fruit or a drink to each lunch. Feeling hungry at work? Explore the lunch options on the Eatz Catering website right now! Remember to call or email us with your questions; we’re happy to serve you.